1. What do most of you have for tire air pressure on stock size tires? 2. What fuel do you run? Is there a need for premium (92 octane) with compression only being 6.9:1? (forgive me but I am new in 2-stroke world). 3. Shop manual, any recommnedations? 4. Basic setup, where do I learn about air/fuel mixture setup, carb sync, idle speed, etc? 1. Engine runs strong, it has less than 8,000 miles. It accelerates really well (at least that is how it feels to me) however at coasting or compression braking (throttle closed) I get a lot of bucking and surging. Any ideas? Run premium fuel ALWAYS! You are running too lean and that's what you are hearing when you are cruising along at speed at part throttle. keep the needles near the middle, set the float height at exactly (this is critical) 15mm, use a 30 or 40 pilot jet and play with the air screw some (start at about 1 3/4 turns out and go in from there till it runs smooth but doesn't make any clicking noises at about 60 mph for about 10 minutes). Run a STOCK air filter and baffles in the exhaust. Using a dial indicator and volt ohm meter (this is a must) set the timing at 2mm before TDC. At this point the points should just begin to open. You can tell this by the needle just starting to flutter on the vom. The points need to be set first. Do this at TDC and set them at 13 thou. R5s are bullet proof, but until you get them set up right they can be difficult. It is extremely important that everything be correct for them to run right and be dependable. Once there they stay there with little work so take the time and set it up right now. Hmmm... I have a bit of that bucking, so perhaps my timing is off... It's been about a year so I'm sure things need to be checked and reset. These days everyone is writing in, from all over the place, to show me their R5s... this one from Finland! I like your R5. Also you have a very informative site. Here's mine: Got it off eBay just like you. 5,000 miles - I paid $900. Think you did a little better - but she's in great shape huh? A very fine specimen indeed! Wonderful paint! And in Bermuda! Shucks, you are one lucky person! Thanks for sharing, Chris! BTW, you can clearly see how Chris' R5 has the turnsignals mounted on the forks... this is how they were mounted on my bike, and I relocated them to the depressions on either side of the headlamps to make room for the clubman bars (see May 17th entry Relocating the front turnsignals below). First off I'd like to compliment you on your fantastic looking R5, I hope mine can some day look that good as I am in the process of restoring it right now. I just had some questions that you may be able to answer for me regarding the points and condensors, Would you happen to know the point gap and its timing as well as the gap for the floats? If you have this information it would be greatly appreciated, or if you have any questions go ahead and let me know. Thank you very much. Timing should be checked anytime the points are re-gapped. 1) Install a dial gauge adapter in the plug hole on the cylinder head, then install the gauge. Set the indicator to zero when the piston is at top dead center (TDC). Rotate the crankshaft against the normal direction of rotation to 2mm BTDC. 2) Set the point gap at 0.3-0.4mm (0.012-0.016") by moving the breaker plate. When adjusting ignition timing for the left-hand cylinder, adjust the point of the LH terminal (orange), while for the right-hand cylinder, adjust the points of the RH terminal (grey). 3) Connect the positive lead of the point checker to the insulated point terminal. Ground the negative lead of the point checker to the engine or chassis. 4) Loosen the breaker plate setting screw, and move the plate to the right or left with a flathead screwdriver until the point checker indicates the points opening at exactly 2mm BTDC. Do not fully loosen the screw, because the breaker plate tends to move when the screw is retightened. Turning the breaker plate in the normal rotating direction will retard the ignition timing, while turning in reverse direction will advance the timing. 5) Finally, tighten all screws, rotate the crankshaft against the normal, running direction until the dial gauge indicates 2.5mm BTDC. Then slowly turn the crankshaft in the normal running direction. The point checker should just swing into the green at 2mm BTDC, indicating the points are opening causing ignition. 6) For best performance each cylinder's specifications should be nearly identical. Point gap (L&R) should be identical and timing should be within 0.05-0.10mm. Timing on any one cylinder, besides being in balance, must be +/- 0.1mm of 2mm BTDC. As for the gap for the floats, they should be set to 15mm. After looking more at the TR3 versus streetfighter R5 I was talking about a few days ago (June 5th), I started thinking... I like that bike because it's so stripped down... why not strip it a bit more? Nice bike, excellent, I am glad it fell in some good motorcycle lover person. I am looking for one myself, I love 2 stroke motorcycles, my passion, but, unfortunately, nowadays, there are non in the market, at least in the US. Great bike, and those cafe bars / club man bars are excellent. 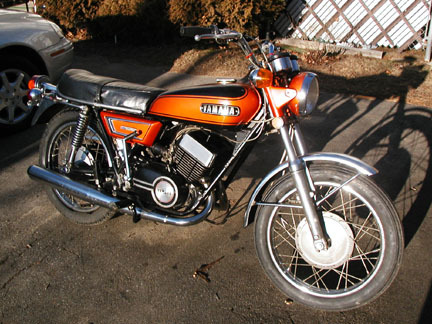 For fun, perhaps a nice exhaust system will add power , and that nice sound we 2 stroke lovers like.